Dead Horse Point State Park and the Island in the Sky District of Canyonlands National Park are located less than 20 miles away from each other. When my husband and I planned our epic Southern Utah Road trip back in 2010 we planned to visit both parks in one day. We stopped at Dead Horse Point State Park first, and then continued on to the Island in the Sky District of Canyonlands. If you have the time and the money you should definitely plan to visit both parks. But what if you only have time and/or money to stop at one? Which one should you choose? Is one park better than the other? Here's my short answer. We'll get to the long answer in a minute. Which park is "better" really depends on what you want want to get out of your trip. For instance, if all you want to do is stare in awe at a spectacular vista, then Dead Horse Point State Park is the place for you. You'll be able to park your car almost at the edge of the overlook. Then the view is yours to look at for as long as you want. However, if you're interested in doing more than just take in an amazing view, then Island in the Sky is probably a better choice for you. You'll get to see amazing vistas, as well as hike to a cool feature such as Mesa Arch. So how do you know which park is better for your needs? I've gone ahead and assembled this little comparison chart to help you out. Let's talk about what you see on the chart. Distance from Moab/I-70. Dead Horse Point State Park is the closer of the two parks. However Island in the Sky is not that much farther away. Cost: Both parks cost $10 per vehicle. 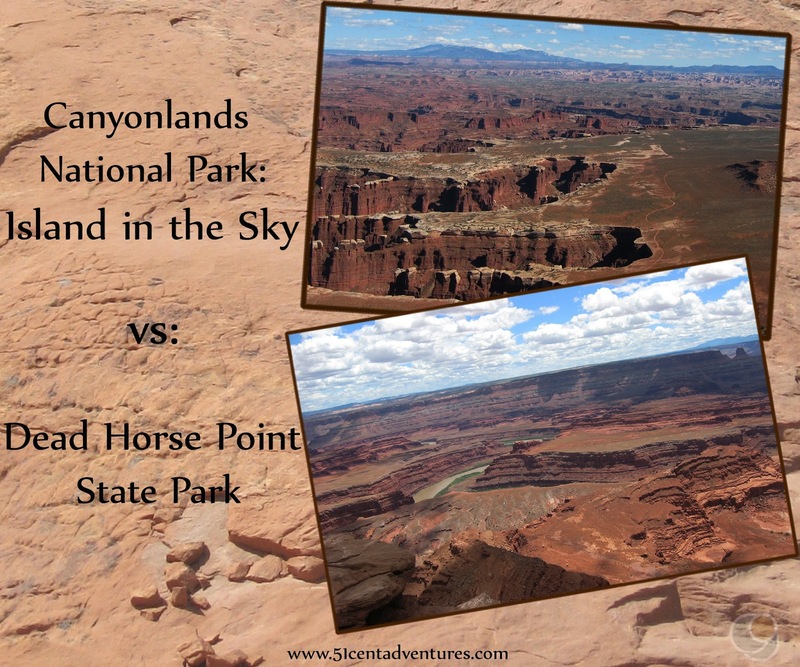 The fee for Dead Horse Point covers only one day whereas the fee for Island in the Sky is good for 7 days. You can also visit other parts of Canyonlands with the same visitor pass that you obtain from Island in the Sky. There is also a Southeastern Utah Pass that you can obtain for $25 at Canyonlands. That pass will give you access to Canyonlands National Park, Arches National Park, Hovenweep National Monument, and Natural Bridges National Monument. 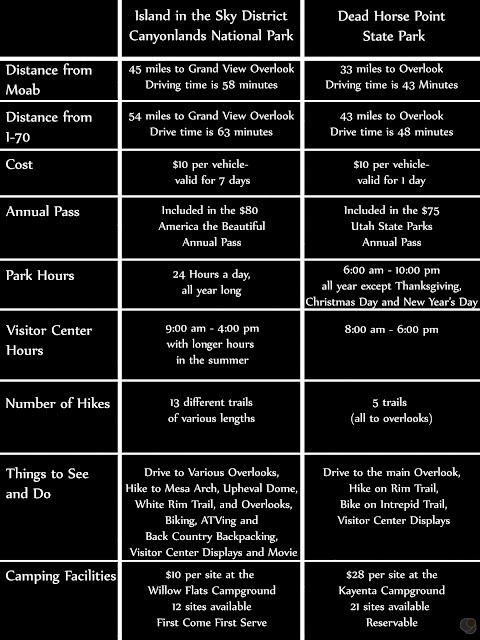 Annual Passes: Whether you already have a National Parks pass or a State Parks pass could be a factor in picking which park to visit. Canyonlands National Park is included in the America the Beautiful Annual Pass that costs $80. Dead Horse Point State Park is included in the Utah State Parks Annual Pass that costs $75. 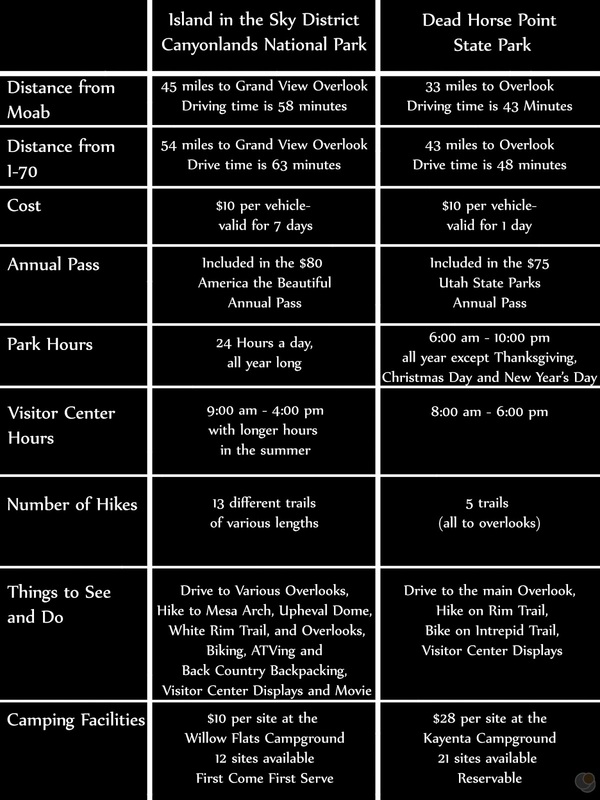 Both of these passes are a great deal if you plan to visit other parks within the year. Park Hours: Island in the Sky is open 24 hours a day 7 days a week. However, most of the trails and overlooks wont be very enjoyable in the dark. Dead Horse Point is open from 6:00 am to 10:00 pm every day except Thanksgiving, Christmas Day, and New Years Day. Visitor Center Hours: Island in the Sky's Visitor Center is generally open from 9:00 am to 4:00 pm, and has longer hours in the summer. Dead Horse Point's Visitor Center is open from 8:00 am to 6:00 pm. Number of Hikes: Island in the Sky has 13 different hiking trails. Some are from the overlooks down to the White Rim Trail, but others are to interesting features such as Mesa Arch and the Upheaval Dome. Dead Horse Point has 5 hiking trails, but they only connect various overlooks around the rim. Dead Horse Point also has the Intrepid Bike Trail which is a serious of trails all on top of the rim. Things to see and do: Island in the Sky provides many more things to both see and do than Dead Horse Point. In addition to the hiking trails that I mentioned above there are also chances to go backpacking in the back country or go on ATV trails. Both parks have interpretive displays at their visitor centers, but the Canyonlands visitor center also has a short movie about the park. Camping Facilities: The Willow Flat's Campground in Island in the Sky has 12 camp sites available. These sites have tables, fire grills, and access to vault toilets. Firewood and water are not available. Each site costs only $10, but there are given out on a first come first serve basis so you should plan to arrive early to get a site. The Kayenta Campground at Dead Horse Point State Park has 21 campsites available. These sites have electricity, tent pads, sheltered picnic tables, and access to modern restrooms. The sites are reserveable and each site costs $28. There is a reservation fee charged of about $9. There are also some cool yurts that are available for $80 a night. 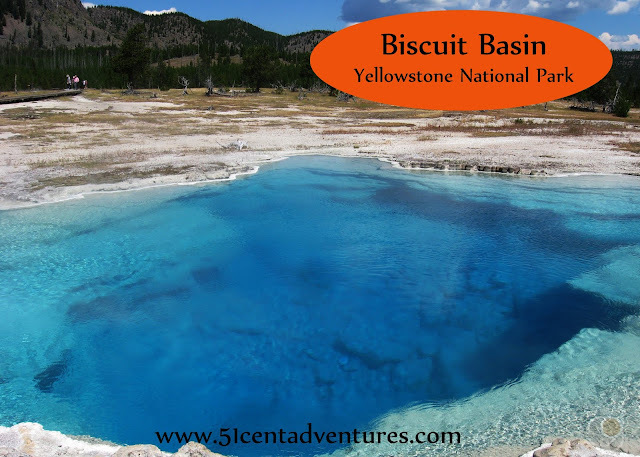 If you still can't figure out which park to visit I encourage you to check out the posts I wrote about each park. Maybe the pictures will help you decide. Here's the link for Dead Horse Point State Park. And here's the one for the Island in the Sky District of Canyonlands. Hopefully this post helps you figure out which park is "better." Ideally, you should try to visit both places. If you can, plan for about an hour at Dead Horse Point and then for at least three hours at the Island in the Sky.